Israel is making headlines again. Americans find themselves glued to the news and recoiling from the idea of a pilgrimage to the land of Jesus. A funny thing: in Chicago 40 people a week are murdered. It is the same in many other major US cities but we never hear about it – it doesn’t make headlines – and we are not afraid to fly in to O’Hare Airport and visit Chicago. But one Jew is stabbed in the West Bank of Israel (where our groups don’t even go) and it makes headlines for days. I have not yet figured out this conundrum. In the US schools are shot up, police officers shot up and many acts of random violence and terrorism take place so that visitors are becoming afraid to travel to America. Americans pilgrims are not the targets in Israel, Jews dressed like Jews and Jewish soldiers are the target. You’ve not heard of an American or a pilgrim ever harmed. They love us – we are their customers! Also, with Israel’s recent reassurances about the Temple Mount to Jordan and the Palestinians, things are already relaxing and tensions easing. We just left Israel with a group and they all commented on how safe they felt through the whole trip. Many Anerican groups are there now learning, praying and loving their pilgrimages. 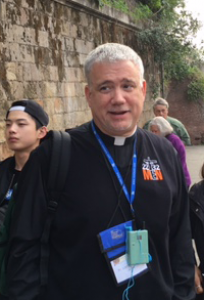 “I’m writing to confirm to you and the pilgrims coming with you next month that it is very safe to come to the HolyLand. What you see on television is not new. These are individual clashes / confrontations during demonstrations between Muslims and Israeli police over disagreements on the Temple Mount. “Again those are individual incidents and unlike presented in the Medea as a General state of chaos and lack of security. “As you know Steve from past similar situations, if this was anywhere close to being dangerous, I would not take the risk nor the responsibility and I would tell you not to come with the group. “I’m with an American group right now and we are visiting the Holy sites as normal as it can be. On Friday Oct. 16th I receive another group of 38 people from Louisiana and no one cancelled. “You are still a month away and I can assure you that these things will not last that long. Pretty soon life will go back to normal and if some cancel they will regret because by then all that is going on right now will be over. “Therefore, I suggest for people not cancel but wait. Please don’t hesitate to ask any further questions. 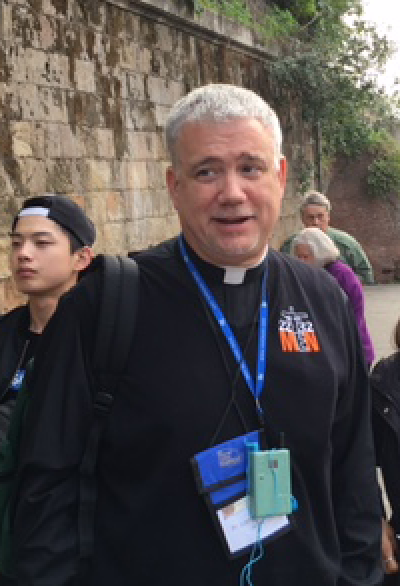 Today everyone arrived and we took off to see Ancient Rome: Peter and Paul’s Mammertine Prison, the Roman Forum, the Coliseum, San Clemente Church and Mass with a tour at St. John Lateran – the Mother Church of the World with the Chair of St. Peter. Great dinner at La Pilotta Di Mario and home to bed. Every day I will record Fr. Larry Richards’s homilies and post them here on YouTube (you know this fun, popular and very devout priest, right?) I will also put up a 15 minute highlights of the day video. Enjoy!